Humans have proven how resilient we are over the centuries. From our primitive ancestors to the modern humans walking the earth today, we have battled plagues, famines, wars, environmental changes, and so much more. Yet as resilient as we may seem to be, we aren’t immune at all to the many other organisms living on our planet and their impact on our health. It’s true we may have developed some sort of immunity or resistance but once our immunity levels go down because of stress, exhaustion or something else, getting sick is inevitable. Our surroundings are a major factor to our health aside from our genes, lifestyle, eating habits, and exposure to certain allergens, irritants, germs, etc. Major changes in the environment can have a big impact on how well or sick we become. For example, exposure to mosquito breeding grounds in Asian countries can put people at risk of malaria or the dreaded Dengue Hemorrhagic Fever. Water contamination can lead to cholera or other gut issues. People get really sick. And what more – in the face of major natural calamities that not only displace people and destroy properties but can even kill you as well like hurricanes, for instance. The hurricane has gone, but health concerns and disease risk remain for all who went through it. Even healthy people, after Harvey’s destructive force, could face health hazards related to polluted air, contaminated water, infected wounds, mold, contagious diseases, carbon monoxide, and mosquitoes. “Going back into the flood environment has risks,” says Albert Rizzo, MD, senior medical adviser for the American Lung Association. The cleanup itself can be hazardous, he says, exposing people to the dangers Harvey left behind. Being aware of the risks and taking precautions can lessen health problems. We all know floodwater is something we should take seriously. Dirty floodwater brings with it various washed out dirt, germs, and chemicals from who knows where. You take the risk of getting sick from encephalitis or other deadly conditions when treading in dirty floodwater without any sort of footwear protection like water boots perhaps. The risk is especially higher if you have open wounds that will be exposed to the dirty water. 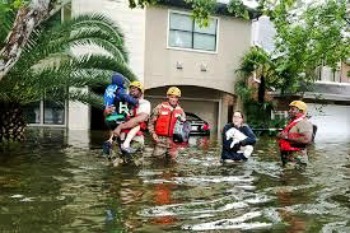 Some people have to brave the dirty water, though, in order to be evacuated and cleanup may take weeks or months depending on the extent of the damage and how soon the water subsides. At least 80 spills from inundated sewage and wastewater systems were reported across Texas as of this week, according to the state’s Commission on Environmental Quality. About 36 industrial facilities reported toxic chemical spills as of late last week, according to an analysis by Environment Texas, an advocacy group. And oil refineries and chemical plants had released nearly 1 million pounds of deadly air pollutants, the Center for Biological Diversity, another advocacy group, said over the weekend. Especially concerning are the high levels of smog-forming pollutants released by the nine oil refineries and hundreds of chemical plants in the Houston area, said Elena Craft, an Austin-based health scientist at the Environmental Defense Fund. Exposure to these contaminated waters, in this case, toxic chemicals, and sewage waste, is a major health risk in places in Texas that have been badly hit by Hurricane Harvey. Even the mere act of breathing can pose serious health risks too and you don’t necessarily have to wade through floodwater for anyone to get sick as at least a couple of carcinogenic chemicals have been released and can make people sick through simple inhalation and likewise result in breathing difficulties. Many chemical plants and oil refineries have been badly damaged by the hurricane making cleanup doubly harder for everyone involved especially the unfortunate residents who are now in the process of rebuilding their lives starting with fixing up their hurricane-battered homes.